First Blush – Tomato Town organically grows heirloom tomatoes in the greater Kansas City area as well as Johnson County, Leawood, Lenexa, Olathe, Shawnee, Merriam KS, Independence MO and Kansas City Missouri, KCMO. Varieties include: Cherokee Purple, Brandywine, Stupice, Carbon, Black Krim, Black Cherry, Yellow Pear, Absinthe and Aunt Ruby’s German Green. 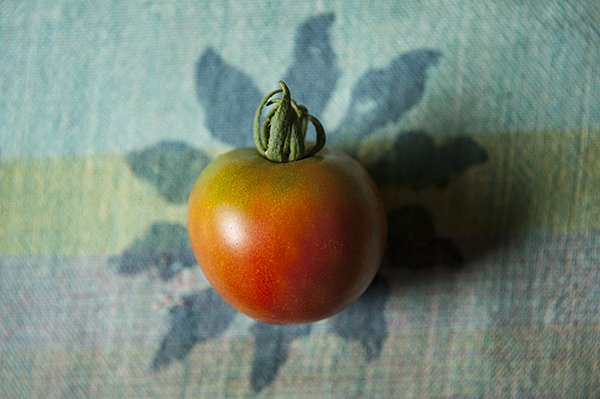 Farmer T was out in the garden tying up tomato plants when he shouted, “We have a ripe tomato!” The first tomato of the season is also the tastiest, so the Czech variety Stupice has long been a favorite here at TomatoTown. Our excitement over Stupice’s smallish red globes may wane as the season progresses , but this variety can always be counted upon to be reliable producers throughout the summer. This entry was posted on Sunday, June 21st, 2015 at 1:03 pm. It is filed under Latest Posts. You can follow any responses to this entry through the RSS 2.0 feed.